It is almost the end of winter, but there is no reason to complain because we are having beautiful weather. I am quite excited because our new house Villa Albizia is finished and I started furnishing. The concept for the house is an elegant beach-house style. As the kitchen comes first we decided to go with a surface that reminds on drift wood. The walls in the living area are painted in beige and cream stripes. But the stripes are running horizontal and the result is stunning. The warm colours support the look and you feel somehow hugged. Very cozy and still elegant. For the bedrooms I went with grey and off white horizontal stripes to get a clean and fresh optic. The headboards for the smaller bedrooms will be light blue and red. Now I am busy researching fabrics for the cushions. They must complement each room and with the red headboard I am looking for something crazy. The cushions for the living room show very bright jungle colours because I wanted to create a bit of drama in combination with the beige and cream. Today I start a very exciting collaboration with Indecorate Berlin. The director and owner, Jule Röthig is very creative and I love her Avant-garde Style. She will create the concept the interior of Villa Sunbird and I am very excited working with her. We started our first project together in Austria, revamping a loft, that is used for the weekend by young people. The result is stunning so far and you will see pictures by the end of September. Last but not least I would like to share my favourite chair with you. 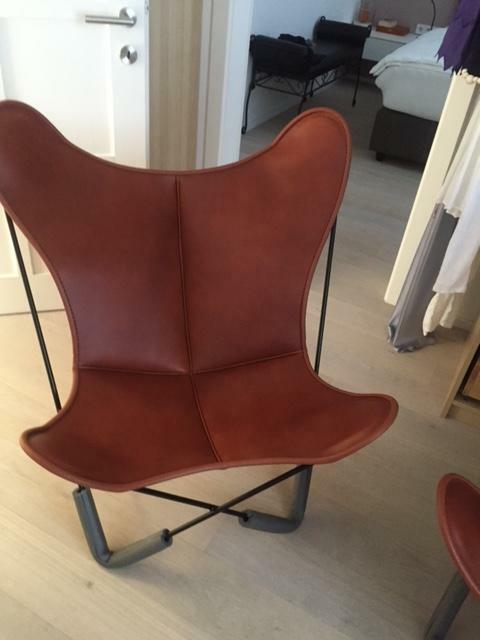 It is the Butterfly chair and I think you will understand my choice, seeing it. All the best.